Testimonials - Mark Sheridan Quarter Horses, Inc. Thank you, I cant wait to get them! I have a cute western pleasure horse I want to do Western Riding with, the DVDs will come in handy. You have the best lead change video out there! I love my set!!! I Highly recommend them !!!! Awesome training tapes!!!! Thank You!!! I have this series and it helped me a great deal! Love it – and thanks! I have these DVD’s and they are great skill builders!!! I got the DVD’s you mailed out. They are great, can’t wait to put everything to work! I got the item I bid on and won from the Audrey Grace Auction!!! Oh my gosh I’m so excited! I felt like a little kid when I saw these in my mail box! I have wanted this video series for awhile!! Let me tell y’all after this next batch of cookies is done bakin’, I’m gonna put on a fresh pot of coffee, snuggle into the couch and start watching them! Thanks SO MUCH for donating this awesome video series to the auction Mark Sheridan!! Class act all the way!! (smile emoticon) Faye M., Merry Christmas and Happy New Year! Thank you for the DVD’s! I think you covered a very tough subject extremely well, I had no idea you were such a good public speaker, but you look great, the DVD’s look great! You probably should make some more, you have a lot of information to give back to the world. Anyway, I appreciate them and wanted to let you know I think they are great! Keep up the good work! I bought your 3 series DVD’s on lead changing a few years ago. It was recommended to me by a fellow exhibitor at the ApHC National show in 2011, I felt I was ready to teach my horse flying lead changes and not sure how to go about it. I am soo glad she recommended your series. I watched your DVD’s multiple times especially one and two while i tried to picture what needed to happen. I am now doing flying lead changes correctly and consistently and this year will be competing in western riding. My daughter and i have taught two of our horses and are preparing our third. We still are working on improving and I am looking at your third DVD, (now that my horse and I are ready for it!) We compete at the local and regional level mostly, doing a variety of events on the same horse. You included a note asking how your series worked for me so that’s why I am writing to you. My daughter and I have done all the training on our own horses and enjoy doing so. Your series was extremely helpful in figuring out what we needed to do and the tips to know if we were ready to proceed to the next step. Thanks So Much! I love watching you work your horses and find your articles on judging etc, to be very informative and enlightening! Are you doing any clinics up this way? I purchased your lead change videos and love them! I also love your most recent article on 10 helpful tips for exhibitors, and especially the part about your pet peeves. Thank you again for including the lower and mid level people of AQHA owners in what you do! Thanks again! I’m still loving the lead change DVDs!!!!! Buy these DVD’s, I bought them last year to help my lazy mare improve our flying changes and it worked !!!!! I bought your video series quite awhile ago now and i absolutely love them! I watched part one a few times and have watched the other two many many many times. My videos arrived safe and sound thank you so much for sending them to me! Your customer service goes above and beyond! I was bragging to my girlfriend what amazing customer service you offer! Thank you very much ! Thank you again. Are you doing any clinics in my area? I purchased your lead change videos and I love them!!! I was talking to a leading trainer in Florida about lead changes, and she told me about your DVD’s. I will purchase them tonight and look forward to receiving them! It is so nice to find someone who not only knows their stuff but who also knows how to teach it to others. Very rare qualities. Mark, I was particularly interested in your lead change instruction. It was clear, logical and so helpful. Thank you for your insight and helpful instruction. I will be studying my Lead Change DVD’s often. Just a quick email to let you know we bought your western riding DVD’s and really enjoy them. Very helpful and well done. Keep up the good work! Can’t wait to see your next one. Hey Mark, I’m pretty excited did two changes one each way, wow it felt great, Thank you He has taken to your program really well- we had never changed leads before, now he changes so easily. I’ve been changing him at least 8 times everyday since I received the DVD’s. But look out next year we will be western riding!!!!! Thank you so much, I’m still smiling! Well I have to report that I just cannot keep the smile off my face. The information on your DVD’s is excellent. I ride a lot of babies and I sometimes have trouble with leads but by using your techniques on the walk through procedure, it is lead change magic!!!!! It’s all about keeping the shoulder up. No more trotting into the lead, its so great the side pass, forward side pass and sweep the front end around, push and lope off. I feel like I’ve won the lotto. Thank you! My older horse has been waiting to do something other than pleasure and he has taken to the program really well. I have always sat on the outside and watched the western riding, but next year I will be in it, at the Nationals! If you ever come to Australia you can count me being in on your clinics! Dear Mark, Thank you so much, the DVD’s arrived yesterday. I sat up all night watching the first one. I am very excited to put your program into practice. I think your program is just what I’ve been looking for. Thanks again! My trainer is having me watch your DVD’s, I like them a lot! Hello Mark, I ordered and just received your 3DVD Set, The Ultimate Lead Change Series. I can’t thank you enough! I watched your first and second DVD twice, went out and saddled up and put him thru the exercises you described. OH MY GOD…. He changed on a circle in and out of a counter canter almost like he had just been waiting to be asked correctly. I changed direction and got a few changes going the other way and called it quits. I don’t show my horse but Flying Changes have always been out of my grasp and something that I have always wanted to fix. I can’t wait for morning so I can go out and try it again! Thank you so very much… you have no idea how happy I am to have gotten your advice. You have taken all the confusion out of a change for me and made it simple to understand. Someday I would enjoy attending one of your clinics if you ever come out East. Thanks Again! I looked at your DVD’s and I am greatly impressed. We’re enjoying the set of 3 DVDs! I really love the lead change series videos! They arrived this morning. I appreciate you sending another set and I am anxious to watch them. I have been working on body control and think I am making progress, but I’m sure these videos will help immensely. Thanks! I’ve been looking at your DVD’s and am glad I ordered them! I am watching your DVD’s and learning a ton. Thanks! Nice talking to you this morning. The #1 video was great so I would like to order #2 and #3! I have been working with a trainer for lead changes without a lot of success. After watching video #1, I realized that a lot of information had been missing. I look forward to #2 and #3, and now feel confident that I can achieve lead changes on my own! Thank you for an easy to follow, and very informative video series. Mark, your DVD’s are the best. So proud of you, I really liked them and the bloopers at the end were great! I’m sold out of your videos. I need 30 more sets fast! I received your DVDs yesterday and watched No. 1 and 2. They were very informative and I plan to go out and work on the suppling exercises tonight! After watching your videos, I can see how important cadence and rhythm is and I’m going to be working on that, the videos are great visual confirmation. Also, the tip about keeping your hands in the same position before, through and after the change was very well demonstrated! Thanks again for the prompt sending of the DVD set! I recently ordered the first DVD of the series of Lead Changes. By the way I loved the first one and plan on using the info!!! Thanks for taking the time to make this DVD series. I really enjoyed #1, and can’t wait to get #2 & #3!! Thanks again for an excellent training tool. I can’t wait to get started! I wanted to “thank you” for taking the time to contact me directly about the DVD’s that had not arrived!! I heard from Mary…they arrived TODAY!!!!!!!!!!!!!!!!! She’s thrilled!! I received your videos and have watched all three. I can’t thank you enough for: a. putting the very green horse new to changes in the video b. including horses at distinctly different levels This is a big help instead of all finished horses! Looking at your clinic calendar, I don’t see an opportunity to ride with you this year but remain optimistic I might get to someday. In the meantime, I am certainly enjoying your video series! WOW, thank you. I enjoyed my first look at the DVD’s last night and these are going to be so helpful!! I am still planning on talking to my trainer during the holidays to possibly call you for a clinic in 2011. Again, thanks for sending the DVDs, and Merry Christmas!!! I am really enjoying the set and can’t wait to start some of the new exercises with my gelding. Hi, Mark! They were FABULOUS! Really helped me so much! I wanted to say how much my trainer and I have benefitted from the lead change videos that I ordered and received! We like your program a lot! Thank You! I watched the first video and love it! It is so well done. I love the exercises to build up to the lead changes. We are going back and working our horses on those exercises before we move on any further. I really like the drill to get them used to changing off the switch of your legs. I had never heard it explained that way and it really made sense to me when I heard it. We are loving that second DVD….mountains of information to cram between our ears. You really did a great job on the DVDs! I have watched your first lead change DVD a couple times, and then saw your second one this weekend. First, I loved the way the second DVD showed a variety of horses in different stages of training (and loved seeing the improved Joey, too!). I also REALLY appreciated the diagrams for the exercise in the first DVD. Secondly, IT WORKS! Now, I realize the mistakes I’ve been making, and after working a couple weeks on the exercises you described, I did a left-to-right change WITHOUT dragging his hind lead! It was a real lead change and I don’t think I’ve ever gotten a clean one going that way before! I was so excited! Thank you so much for being able to communicate to other people how to train for a good lead change. It’s a monster to try to figure out on your own, and your DVD’s were able to break it down and communicate it well enough for it to be successful from the get-go for me! Thanks Mark! I’ve seen with my own two eyes how your system works amazingly! The DVD’s are GREAT !! We were glued to the screen watching your hands (wonderfully quiet) !!! I received you new DVD and I am enjoying learning from it immensely. You break things down so it is easy to understand. I like the way you explain things in diagrams and then take it to the next step by showing the viewer on the horse and putting it all in action. The repetitions of maneuvers that you do on the horse are also very helpful to me. I’m watching your video daily so I’ll be ready for the next one. Please advise me when it’s available so I may purchase it. I’m looking forward to future learning about the timing involved in this lead change maneuver. I purchased your series of DVD’s last year and I just wanted to thank you for them and say how good they are. I really was impressed with your service and personal note. I ordered a set of your lead changing DVDs this winter and used them to teach and refine my gelding’s lead changes. I wanted to thank you for the great visuals you give on your DVDs, as they have helped me with my work on my gelding and have also helped me to see what others are doing right/wrong. I plan to watch DVD number two again, to refresh my memory and head into the second half of the show season. This past weekend, I got my first points in amateur western riding, against some veteran lead changers and am thrilled to bits! Thank you Mark for the GREAT tapes, there are lots of points that I never even considered, now I just have to put it all together. Learned more from the videos today- my horse is responding well- thank you. Watched your DVD’s and loved them… Thank you for the note, it was a nice touch when I opened them. I am looking forward to watching them. Heard great things about them! Thanks for making such great DVDs! After watching the first one we are already doing lead changes easily. Your step by step makes them so simple. I bought your DVD’s series, The Ultimate Lead Change and I want to tell you that they’re great. I learned a lot and they’re a big help with the training. Thanks, and kind regards. Because of your lead change videos, I look forward to working with my horse on a daily basis. I purchased a trained reiner that was not finished in lead changes. I was told that she would never be good changing leads. I was a saddle seat rider and had never changed leads until I purchased my mare. She wasn’t good and I had no experience, not a pretty sight. I had a chance to send her to a top ten reining trainer but decided to purchase your videos instead. What a great decision. After doing all of the exercises over and over, I finally decided to start changing leads. All is going very well and she and I are getting better every day. The only times she doesn’t change well is when my timing is off. We are even changing leads from counter canter to counter canter in a straight line. So much for a horse that couldn’t change leads. Just wanted to say thank you for such an informative and simple to understand video series. I just finished #3. It was great. Loved the out-takes. I have your video set and love the information! It is really well done and helps break down the lead change to something pretty easy. the lead change DVD’s are fantastic! That’s the best hundred bucks I’ve spent in a long time. Do you sell any others? your tapes arrived today. We have watched the first two and we are very, very pleased. Thank you much, I am sure we will be watching them alot this winter. Wish you all the best. Thank you again, the DVD’s this year were a big hit in the auction. Take care! I thank you and your son for your DVDs under our Christmas tree. Pretty funny that I immediately went to watch videos and left the rest of the family to unwrap presents without me. Thanks again and take care. I will thank you personally the next time I am showing my reiners in Scottsdale. I received the DVD’s today and I wanted to let you know I appreciate your hand-written card. If it wasn’t so far, I ‘d be headed your direction to ride with you! Thanks! I was thinking of the WEALTH of information you have put in the discs which is already helping us, but after watching the outtakes, I laughed and thought of all the training DVD’s that I have, where the wind is howling and the audio is bad. Your hard work is evident and you should be very proud of the product. Yes, keep me on the email list for the next series which I so hope is trail…. Mark, I want to thank you for such informative DVD’s on lead changes. Your explanations and demonstrations are excellent.! Thank you for sharing your expertise and your exercises. Hi Mark; I recently bought your lead change DVDs and find they are awesome. I breed a few horses mainly reiners here in Mackay in Northern Queensland Australia and have problems getting them through the lead change part of their training. My nearest trainers are 900 km away so it is hard to have lessons but now I have a program! Thank you so much! Hi Mark, I ordered the DVDs for my sister who shows AQHA novice amateur, she asked for them as part of her birthday present. She saw your DVDs when she googled lead change videos and yours was the first to come up. We have watched you show for years and are looking forward to watching your training tips. Hi Mark, Your 2nd DVD came first and it was one of the best that I have ever seen on lead changes. So the next month, we got the first video which was great also. Well, they have so much information, I decided that I wanted those DVDs because I wanted to watch them over and over. Also I wanted to watch them in order because one lesson builds on the previous lessons.So, I googled your name and saw your website and that I could order the set which I did! You do a wonderful job explaining and demonstrating teaching and riding lead changes. With your instructional videos, I understand so much more about how to make it “all come together”. Hi Mark, I received the DVD’s in the mail and look forward to watching them. They came highly recommended from Les Vogt. Do you have any clinics coming up, or time to give a private lesson, towards the end of this year or the beginning of next year? I would like to ride if possible, and thanks again for sending the DVD’s. Hi Mark, my wife has watched your training tapes a number of times and thinks they’re great! 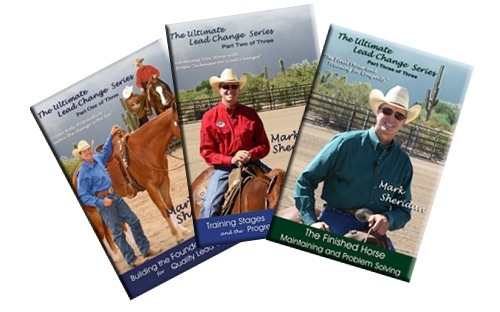 Hi Mark, some time ago I purchased your three DVD set on the Ultimate Lead Change and have watched it a number of times in an effort to further educate myself and my horse. I found the DVD’s incredibly informative and started to apply many of your techniques with my current horse. Hi Mark, I bought your DVD’s for my daughter at Christmas… She is using them to help her put lead changes on her two show horses… I am already seeing positive changes with her horses! Hi Mark, your DVD’s are great, they are WONDERFUL learning tools from the BEST!!!!! Dear Mark, I just want to say thank you again for all the skills that you have taught me from your DVD series. This year I am competing in western riding for the first time ever and I’m so excited about it. It has taken me a while, but I’ve finally made it to the fun part of the lead changes. I don’t compete in western riding and reining, but thanks to you I’m about to give them a go also. I also ended up High Point Amateur of Australia and Runner-Up High Point Performance Horse of Australia. I feel very blessed indeed. I hope to one day come over to ride with you if that is still an option. Thank you again, I just can’t stop smiling! Mark: Thanks for the note along with the DVDs on Lead Changes. I just watched the first one…the exercises are great, nice job, easy to follow! I am looking forward to watching the second and third DVDs! Hello Mark! They’re coming along great! I’ve put changes on a couple of different horses and they’re doing well! The DVDs are great! “Hey Mark! I Just got done showing today. I definitely need some Mark time :-). Plan on us visiting this winter! We scored a 75 on our western riding pattern (pattern 2). It felt fluid. I straightened my first circle a bit to line up for the long line of changes. Got accurate placement, and now I am stuck with how to improve. Going to watch part 3 of your series again when I get home… Really just wanted to say thanks again for your time and a great horse! We walked away with show high point. Thank you Mark for your help .. I got four nice clean changes today with a little bit of speeding up after the change and I am delighted! I have joined your facebook business page. Thank you again! I used to ride with Mark and I swear he could teach a camel to change leads. Thank you so much Mark for the donation. They are always a favorite on the auction. You were referred to as the BEST in instruction when someone on the forum asked which ones to buy!! I also have heard that you can really TRAIN one to do the WR and “some” of the others need a ready trained horse. 🙂 Someone also posted you could train a Giraffe to do Western Riding! I was a lucky winner! I am VERY excited to watch them! I have a son of Seven S Flashy Zipper that should be a natural that I need to teach to do this and I have no idea how to do so 🙂 Thanks for donating so much! Hi Mark, I’ve been thrilled with the lead change videos! Now to get my horse to come around, our last ride was much more improved! Hi Mark, as an amateur training her own horses, smaller steps really do lead to larger goals. After thanking Santa Claus for your DVDs: THE ULTIMATE LEAD CHANGE SERIES……I invited a friend over to watch the whole series. When you are pretty much training your horses on your own you find all sorts of videos and even a few books that offer good advice. However, when I got on my horses it just didn’t translate. Not true with your series. I took my time and didn’t get frustrated or push harder than my horses could go. One of the biggest helps from your DVD series is that you rode horses at different levels. This was a huge help! After watching all of the DVDs and letting it sink in, my gelding is now getting plus halves on his lead changes, and more importantly, I am happy to do my best to set him up, sit tall, look forward, and ask. It is a ton of fun to ask for changes now and he is even willing to do them every couple of strides and any direction. Thank you so much Mark for taking the time and putting in the effort to making THE ULTIMATE LEAD CHANGE SERIES. Hi Mark, I was the high bidder on one of the Lead Change DVD sets that you donated to the Audrey Grace Auction. Thank you very much for donating to the Audrey Grace House charity and for helping the children of New Horizons. I look forward to watching and learning from your series. Hi Mark; I used your DVD’s to get my reining mare changing leads and rode her in our National Non-Pro Futurity where we placed well. I have sold her on to a new home and started on my next three year old, so the DVD’s are out again. The mare did great changes and a lot of people commented on what a good changer she is!! Thank you so much for making those DVD’s!!! Lexie B. Mackay Queensland Australia. I’ve trained mostly pleasure and cutting horses over the years, horses that don’t need to do lead changes. So when my customer Pat Chinick wanted to train her horse to do them, I knew we were going to need some help. We read every magazine article on lead changes we could find, and she bought DVD’s from one of the top trainers in the country. But what really made a difference was when she got the DVD series made by Mark Sheridan, a classmate of mine at Findlay College back in the 70’s. His DVD’s show horses going through the entire training process, not just him changing leads on finished horses. You see the early attempts which don’t go too smoothly, then the same horse later on doing beautiful changes. So when your first attempts don’t go real well, you know that his program will work if you stick with it. Pat and I watched the DVD’s, then I helped her apply the concepts to her horse. These are the results. Mark, I want to thank you! Thank you Darrell for your patience and guidance in helping me work through the steps involved in doing a smooth flying lead change, and thank you to Mark for creating this DVD series that helped make it all happen. You both are the best! Thank you Mark for creating this DVD series. I can’t say enough good things about them. I had read many articles on lead changes before you came out with these. But there was always a missing link when I tried working through the process. Your DVDs break down the steps so beautifully and filled in the gaps. So it was understandable and less frustrating. I am having a blast doing flying lead changes with my horse. They would definitely make a wonderful gift for that special horse person. Watching your lead change videos…just realizing how much I learned from you and wanted to thank you for that. I just watched your video last night on lead changes, volume 1, and I have to tell you I think it is the best lead change video I have ever seen. Hi Mark, I won my western riding class today!!!!! After watching the first DVD I discovered my mare was really lazy about two tracking. My trainer saw a huge improvement in our lead changes. The second DVD has help me cue her better. I haven’t watched the third DVD yet, but look forward to it. Thanks! I am so thrilled to have found these lead change videos!! I’ve not done much lead changing — because of lack of knowledge on how to do a correct change.. We do a lot of showing, but simple lead changes in our pattern classes.. We have many of the maneuvers down pat, now to put them together and learn your sequence. Thanks again for putting out such an informative video for us! I bought your Ultimate Lead Change DVD series, and am impressed with it and hopeful that I can improve my mare. She is a big horse, and typically drags a hind lead for a stride or two when I ask her to change. With the drills you offer, I hope I can get her problems corrected, and although she’s not built to be a fluid changer, I can at least get her better. Thanks for the education. Hi Mark. Thank You for uploading these videos on the Ultimate Lead Change Series. It has made my decision to purchase it so easy =) I never realized how simple it could be when you look at the change one step at a time. All of your horses lope so natural, and changes are right on the money! I hope my DVD’s ship quickly I am really looking forward to learning more about your method!